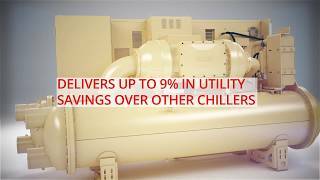 Trane Agility™ centrifugal chillers continue to maximize building performance by providing a solution that is compact and environmentally sustainable. Trane Agility™ centrifugal chillers continue to maximize building performance by providing a solution that is compact and environmentally sustainable. Combining efficiency and reliability, these chillers meet a wide range of rigorous conditions to improve building performance. Compact size enables the unit to fit through standard double doors, making it an ideal replacement solution. Chiller design is optimized to fit within existing infrastructure, reducing installation complexities. Part of the EcoWise™ portfolio, Agility™ chillers utilize R-513A, a next-generation, low-GWP refrigerant for environmentally sustainable operation. Combining an innovative 2-stage compressor design that leverages oil- free, magnetic bearings with advanced heat exchanger technology, Agility™ is optimized for efficient performance and reliable operation — all backed by an optional 10-year extended warranty from Trane. Outstanding full- and part-load efficiencies along with greater serviceability create a cost-effective cooling solution.